Farrell’s hurleys present “The life of a hurley”! Oh, and €3 pints of Five Lamps and Bulmers from the outside bar! It would be great to see everyone stay to support the Senior Football team as they take on Erin’s Isle @ 6.30 pm. Things kick off at 4.30 pm. It’s a short event so come early so the kids can try everything. Pack a bite to eat, bring your neighbours, bring your granny, bring your friends. Everybody welcome. INTERESTED IN COACHING AT CAMPS? SuperValu Killester are running an initiative whereby for every purchase over €20 customers can 'vote' for their local club to receive football equipment. Please support the Club if you find yourself shopping in the area! The way in which we pass down skills to younger members is crucial to the future of the Club. Pitch side advertising is a great opportunity for organisations to raise their profile in the community & in the club, in addition to providing the club with much needed funds. The costs are very reasonable and work out at about 8 EUR per week for a 3 year term. If you know of a company that might be interested in sponsoring a pitch side banner in Scoil Uí Chonaill grounds Please contact Aidan Mulvey @ 086-1450407 or Killian O'Connell @ 087-2072866 for further information or with potential opportunities. Can always be heard (in Scoil & on social media!) 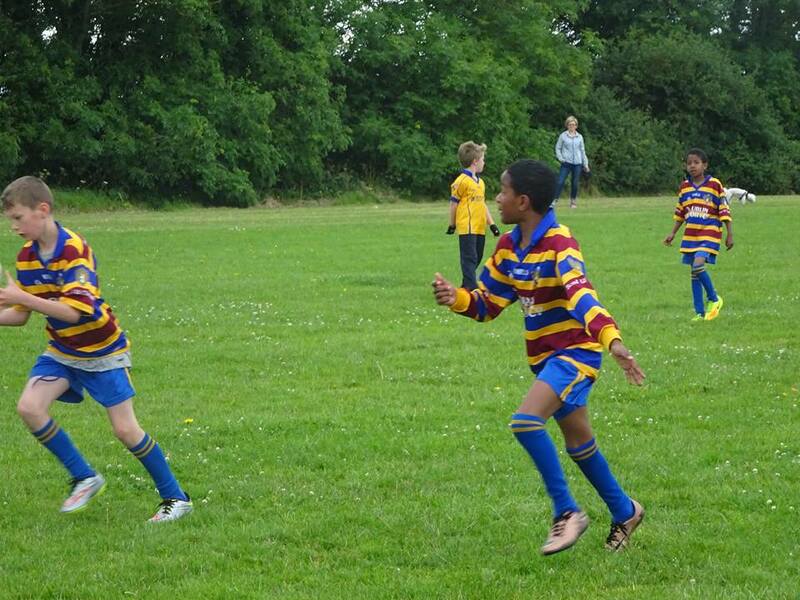 and is a driving force behind the 'Tough As Teak' u10s...meet the 'lovable lab' JP Courtney! How long have you been involved in Scoil Uí Chonaill? Since 2010/2011 when my young lad Alex started in the Scoil Nursery. Do you have any nicknames? How do you like to be addressed? Grew up in Beaumont, Dublin 9 but 100% Griffith Avenue, Marino Schooled - Currently reside in Dublin 13 or on The periphery of Portmarnock and Malahide (when selling the house). How did you come to be involved in Scoil? Destiny! Worked for years with Peter Cronin & Dave Ryan (Two Cork Men) and they were always going on about how great Scoil is! As luck would have it both my kids enrolled in Scoil Neasain and given its strong links to SUC (which I was unaware of at the time) we kind of drifted Clontarf Road way. It also helped that the incoming GPO at the time was a Courtney! Briefly describe your Scoil career as a player / mentor / contributor, if any. Despite my best efforts, I ended up as joint mentor of the U8/2007’s (Joanne Courtney/TJ Farrelly pulled a fast one!!) with my partner in crime, Liam Ryan (ex Scoil Hurler). Turned out to be great decision as I’ve become great mates with majority of the Juvenile Mentors. What would you say you are most known for within Scoil? i.e. what do people associate you with? Being Loud!!!! /Joint Mentor to the “Tough As Teak” Team. What has been your greatest Scoil moment / achievement? There have been many great moments but seeing Alex and his team mates (Boys & Girls) grace Croke Park at the Go Games (07/14) and obliterate their all boys opposition was an absolute joy to behold! In interest of not being beaten up, seeing my daughter Eve play/score/win U15 Shield Medal v Clontarf last year was fantastic, especially on back of her U12 Dublin Debut. What is your profession / field of study / passion? Filthy Banker specialising in Credit & Finance. What are your favourite hobbies outside of GAA? Sampling 5 Lamps with Liam, Aidan & Ronan for our buddy Ross Bissett- Purely for market research though / Avid Sports Fan particularly Tennis, Boxing & for my sins Aston Villa. If you could make one addition to Scoil in any way (don’t be restricted by the plausible! ), what would it be? Like most people, would love a full sized Astro Pitch and new Hurling Wall installed. What is your favourite Scoil ‘quirk’? Scoil’s eclectic mix of club members and its welcoming approach to all walks of life. If you close your eyes and envisage Scoil in 10 years, what do you see? I truly believe the majority of our current U10’s will be the spine of SUC’s Hurling & Football Teams in the future, that are not only competing for but winning Senior Championships. If her drive/ambition is anything to go by, I fully expect to see Eve captaining the Scoil Ladies Football Team in Division 1 also (Johnny / Gus you have been put on notice). Finally, if you had to describe yourself as an animal, what would it be and why? A Labrador / Lovable to a fault but can’t stop bloody eating!! The Senior Footballers embark on another important week as, at the time of writing (Wed 28th), they face St Mary's Saggart and then Erins Isle on Saturday in AFL2. The AFL7 team had a good start to the week with a 2-13 to 0-12 win over O'Tooles. Another successful week as they convincingly beat Clontarf in the IHC on Wed to book their place in the quarter final, and beat St Brigids in AHL3 on Saturday to put them joint top of the table. Scoil’s junior Hurlers advanced to the knock out stages of Junior Hurling Championship, following a more than convincing win away to Wild Geese in Oldtown, North County Dublin. On a warn and clammy even in North County Dublin, Scoil travelled in confidence, knowing a win away to their opposition would secure another venture into the knock out stages of the Junior Championship following their previous win over Kilmacud had re-railed their Championship ambitions. Hot on the heals of the Intermediate Hurlers beaten local derby rivals Clontarf, a strong Scoil squad was assembled and travelled in buoyant mood. Tiernan O’Frighil, continued his impressive form for club in both codes by partnering Daragh Reddy, who himself has struck a rich vein of form recently in the middle of the park. Mark Cuningham was guarding the house with his willing deputies Farrelly and Cian O’Donal, with the evergreen Chubb’s, orchestrating proceeding from the goal line. Another evergreen starlet was Richie Flavin, who dominated the centre back position with Davy Conlon and young Sam Callan offering considerable support up the flanks and acting as the perfect spring board for Scoil’s deep attacks. David Kennedy continued his rich scoring form and along side the majestic Ruairi Egan, who’s powerfull direct running were cutting deep holes in the “Geese” defence. It was one these deep runs, involving Egan and Kennedy swapping passes which led to Shane Cotter, another one of the evergreen group, scoring a sublime volied finished into the roof of the net. This fixture saw a welcome return to the Scoil line up by Sean Mulligan, who wore his distinctive “second generation” Micro Hurling helmet and amassed an expensive 1:06 haul from play. Scoil’s dominance of the first half, saw them lead by 0:02 to 1:12, with strong individual performances from Ciaran de Burca who was acting as a great foil for Cotter on the inside line, with Conor Ennis proofing more than a handful for the Geese defence. The second half saw Scoil make a number changes to their line up and with view of a long hot summer ahead, Kennedy, Callan and Ennis step aside but worryingly for the “Geese”, the introduction of Caolon Minogue, Aaron Linnane, P.og Egan and Dave Ryan, who was clearly inspired by the recent Cork Hurling renaissance and added an even depth of youth, skill and experience. The “Geese”, obviously stepped it up at the commencement of the second having surely received some harsh words at halftime but Scoil created another goal opportunity through O’Frighil with Mulligan finding the net for Scoil’s second goal. Ten minutes into the second have Shane Cotter shipped a heavy knock and the versatility of two of the elder statesmen of the team was shown, when Cotter surrendered to the last line of defence and Chubb’s taking up Cotter’s previous position on the edge of the square. What a switch in roles this would prove to be, when shortly after, the “Geese” were awarded a penalty. Cotter, stepping into the boots of a long list of great Cork goalkeepers, such as Cunningham, Cusack and Nash, pulled off a spectacular one on one penalty save! From the resulting penalty save Richie Flavin moved the ball up the field to the on running Chubb’s, who drove to the left of the “Geese” defence before delivering a telling pass across the oppositions 21, to find the on coming Dave Ryan, who dispatched swiftly into the roof of the net. Ryan was clearly modelling his approach to the game off Sean Mulligan as he too, dawned the distinctive “second generation” Micro Hurling helmet! Scoil, eventually racked up a score line of 3:17 and came on the back of an excellent winning performance the night previous by the Inter Hurlers, having dispatched of our local rivals Clontarf, 3:14 to 1:11 in Intermediate Hurling Championship. Scoil’s junior Hurlers ended the week on a disappointing note when they shipped a heavy defeat to near neighbours St Joseph’s O’Connell Boys in the Junior Hurling League at a very hot Alfie Byrne Park on Sunday afternoon. Unfortunately a considerably weakened out fit for Scoil travelled the short distance down the coast road to take on our hosts Joey’s, with the ever, evergreen Matt Cushion lining out for Scoil alongside Martin Chubb’s Hewitt, which I think brought combined age of the two man full forward line into treble figures! Luckily enough to help bring the average age of the Scoil line up right down, the young and talented quartet of David Kennedy, Conor Ennis, Aaron Linnane and Sam Callan togged out with Rob Kennedy making a guest appearance for Scoil on the Goal line. The open half saw Mark Cunningham and Padraig Og Egan impress in the full back line with Sam Callan giving a good account of himself in the halfback line alongside Tiernan O’Frighil and David Kennedy continuing with his rich scoring form alongside Ruairi Egan and Conor Ennis who both worked the score board. Unfortunately Joey’s dominance of the first half was built on greater understanding of the artificial surface and their physical stature right through the centre lines, which saw them grab a couple of early goals and had Scoil chasing the game from then. Kennedy with Conor Ennis kept proofing more than a handful for the Joey’s defence with Mark Cunningham and Egan performing some heroics in the defence but at half time Scoil trailed 3:03 to 0:06. The second half saw Scoil faced into a stiff enough breeze in very warm weather conditions, which help Joey’s stretch their lead when they added a fourth goal. Davy Conlon and Tiernan O’Frighil made considerable contribution to the cause but the Joey’s team, who are and remain unbeaten in the League seemed to be able to find an extra man every time they attacked. Scoil kept plugging away and Aaron Linnane produced a moment of individual magic when he went on a mazy run through the Joey’s defence and buried the ball into the back of the hosts goal! Conor Ennis was keeping the Joey’s defence on their toes throughout the game and David Kennedy struck 2 marvellous frees into a stiff breeze. Shane Cotter, the battle hardened warrior that he is continued to work his socks off for the cause and eliminated the threat posed by the Joey’s Centre Half back but unfortunately and despite their best efforts both Cushion and Chubb’s had goal bound efforts scrambled off the line, with Cotter having a goal ruled out which might have upset the tie if they had been converted but unfortunately Scoil finished second best. Great effort by all who made themselves available on a day that saw the Dublin Footballers record a 31 point win of Westmeath as they marched onto their 7th Leinster Final appearance in a row! Had to finish with some positive news! A hard fought win secures Cup semi final spot for the ladies. A fine start with 3 points from play from Aoife De Burca gave no indication of how tough the game would be. Parnells returned with a goal and a point and maintained a narrow lead for the rest of the half. The astro surface and tight pitch made it difficult for the players to find their usual attacking fluency. However as the half came to a close, a pile driver through a crowded goalmouth from Lucy Murphy gave Scoil a one point lead at halftime. Immediately after the restart, as a loose ball was rolling towards the goalkeeper, Emily McMullen showed great determination to poke the ball through keeper's legs to produce a fine goal. The cushion of the lead allowed the players to relax into the game and find their rhythm as they dominated the second half. Parnells continued to make life difficult, and always looked dangerous on the counter. But fine defending from Emma Smith, Ellen McGowan and Canada bound Caoimhe Ni Bhroin secured a semi final spot with a game to spare. The minors were due to play Ballyboden in an MFL3 game last Sunday but Ballyboden had to concede the game as they could not field a team. Last match of season before summer break and as usual two cracking matches against Na Fianna. Game of two halves with Scoil hammering opposition first half but second half the pendulum swung with NA Fianna gaining upper hand. As is customary with this bunch they don't know when they are beaten and despite being 3 pts down with a few mins to play, they managed to salvage a draw from jaws of defeat - They were convinced they'd lost but Ref confirmed draw!! Saved best for last! Kids were awesome with some stunning well worked points/goals from the lads. Fresh from his moment of madness last week, Calvin put in M.O.M. performance but was run very close by Conal Twin & Aurelian. Delighted to see Finn assist point and Alex Cahill putting in strong show in defence. Liam Carr & Cornel worked well up front but got little change. Jack, Fahad, Conor & Nathan had more luck & were instrumental in a number of scores. Well done to all the lads & ever present support from all the Parents. Some nice shots attached courtesy of same - Enjoy! Last week was an extremely busy week for the U9's Scoil girls given it included 2 training sessions, a mid week football match away to O'Tooles and a weekend camogie blitz involving Beann Eadair and Clontarf. The girls (and their parents) really stepped up to the plate with a very high turnout for both matches and training. The trip to O'Tooles was a very successful one as the Scoil girls recorded a fine away win. This was a superb team performance and a real improvement on the previous week. There were too many excellent performances to list however one match incident probably epitomised the effort of the whole team when Abbey and Niamh chased down the O'Tooles leading scorer into the corner, dispossessed her and cleared the danger. Sunday saw the girls swap to the small ball taking on Clontarf and Beann Eadair in St Anne's. While only scheduled to field one team Scoil was called on to field two teams of 7 players because another team dropped out and Scoil had such a good turnout of players. Team Dave played two games against Clontarf, drawing the first and narrowly beaten in the second. This was a very credible performance against a Clontarf squad who are longer established in the camogie ranks. It was a gritty performance from the Scoil girls, none more so than Ciara who battled heroically. Sadhbh and Eabha were a formidable pairing in defence. In midfield Niamh and Caoimhe were busy with Caoimhe not afraid to go forward to score a couple of good goals aided in no small measure but huge clearances by Sadhbh. Up front Aoife had a number of good shots on goal while Aoibhinn had an incredible first ever game for Scoil with a goal to boot. Team Sean played two tough matches against Clontarf and Beann Eadair losing out narrowly in both. We dominated the first half of both games on the ground showing that effort and determination weren't in short supply. Unfortunately we still have a bit of work to do on lifting skills, which a small number of the opposition had clearly mastered, but they were made to work with some heroic air blocking particularly by Abbie. The opposition hadno answer to Aishat and we felt her loss when she went off injured in the first match. Caragh was a rock in defence throughout. Taiya and Martha battled well and really grew in to the game. Nessa and Aibhilin were very close to matching the opposition for skills. 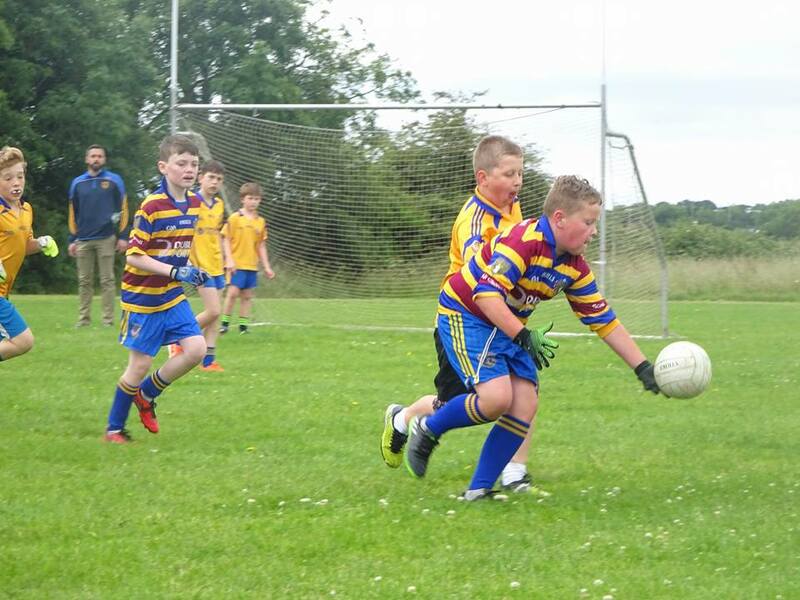 The U9 boys took a trip out to play Tyrellstown last Saturday on what surely one of the hottest days yet. The two teams opted for a larger pitch and played 10 a side. The two teams were well matched from the outset. Senan opened up the scoring with a goal from close quarters. After a missed follow up opportunity Tyrellstown were quick to respond with a rattle of points in the following few minutes. Joe was quick to respond, scoring a neat point from a free. There was great tenacity and competition shown by both teams throughout the game particularly in midfield where the triple act of Temi, Luke and Callum proved very hard to get by. Cillian and Jake once again showed the strength of their pairing up in the latter part of the first half with some great forward work and a few more points. Eoghan Óg and Callum played Trojan roles in defence, winning two-to-one balls on multiple occasions and giving our keeper a welcome breather. We finished the game with very little in the scoreline and were treated to some very welcome ice pops by Tyrellstown. The team and skills are progressing well. Keep up the practice. Sunday was the last girls U9's football match and the girls really finished on a high note with two excellent wins against St Maurs. It's been a very successful first half of the season for the girls, with them competing at both football and camogie as a team for the first time. To celebrate the success we raided the scoil bakery! Team Dave delivered some fine interplay as the girls demonstrated the benefits of playing as a team over the past few months. There were some great performances across the board. Probably the stand out performances came from Nessa and Taiya who showed that their skills are developing and were rewarded for their efforts with some brilliant scores. Caoimhe and Sadhbh chiped in with some fine scores also. Cliodhna demonstrated what a clever player she is with some great passing. Eabha and Niamh were dominant in midfield in the first game and always first to the ball. In the second game Lauren and Emily moved to midfield. While playing together in the middle of the park for the first time they sisters reminded us that what is rare is wonderful with a real battling display. Team Sean (greatly assisted by Finbarr and Aidan C) played some of the best football we have seen all season and had two great wins. In the first half of game 1 we dominated the possession but didn’t make it count on the score board. In the second half the girls followed Finbarr’s sound advice and moved the ball earlier to create the scoring chances that allowed us to pull away. Game 2 was an open contest in the first half and despite early pressure we got hit on the counter attack for a few early goals. In the second half we got to grips at midfield and finished strongly with some fantastic scores. One of the highlights of the match was a fantastic save by Emilie Curran and two superbly struck points by Aoife. Scoil were represented with distinction by Aishat, Abbie, Ciara, Emilie, Martha, Sadhbh, Laura, Aibhilin and Aoife. The lads are having a harder time than the girls! They had a home game as the last match of the season on a sunny Saturday morning. We had a good turnout and fielded two teams but were up against a very strong Castleknock team and were well beaten in both games. We had some good individual performances in difficult circumstances and team Colin and Cormac managed to bag a few points in their game. In the other game team Brendan and Alan were well beaten but there were a couple of good individual performances from Luke, David and Noah when he appeared in the second half. We felt a bit like Westmeath against the Dubs at the end of the game! After the game though we did a presentation to the kids for players of the season. We gave every child a football or sliother which we hope will be put to good use over the summer. Congratulations to our two players of the season Conor Meehan for football and Killian Gilbride for hurling. Both of them have made great contributions all summer at training and in games as of course have many other children. It was a close run thing but the two lads can feel very proud of themselves. We have a few pictures of the presentations for the boys team. Keep up the practice over the summer we really need to work on our skills for September. 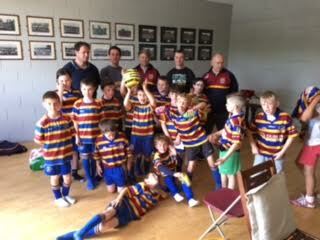 The u8s welcomed Naomh Barróg for the 3rd (if not 4th!) time this year. Scoil were looking to improve on our previous outing against them and the kids did themselves proud by putting in hugely determined and concentrated performances. For the Ambers Conall and Oisín put in very strong performances tackling hard, winning ball & clearing long ball from the back line. It was great to see Jake back from his sojourns abroad playing strongly alongside Paddy in midfield. Sebastian and Jamie too were focused and involved in the game today. For the Blues, our new player James had a great debut for Scoil, scoring some nice points and a goal. Tadhg showed he's a chip off the old block with a fine display in goal. But we won't pigeon hole him just yet as he also did well later in defence and midfield. Emily ran tirelessly for her team with some great marking and support play while Rian and Abigail made some great attacking runs. Finally, one of the displays of the season so far came from Sean on the Maroon team. He moved quickly into space when he got the ball, he brought his team mates into play with some neat passing and curled a number of sublime points over with both inside and outside of his foot while on the run. Orla and Conán worked hard in both defence and midfield, while Danny also chipped in, with some nice kickouts at one end and a couple of points at the other. Well done to everyone on the day and on their dedication during the season. Matches start up again in late August. 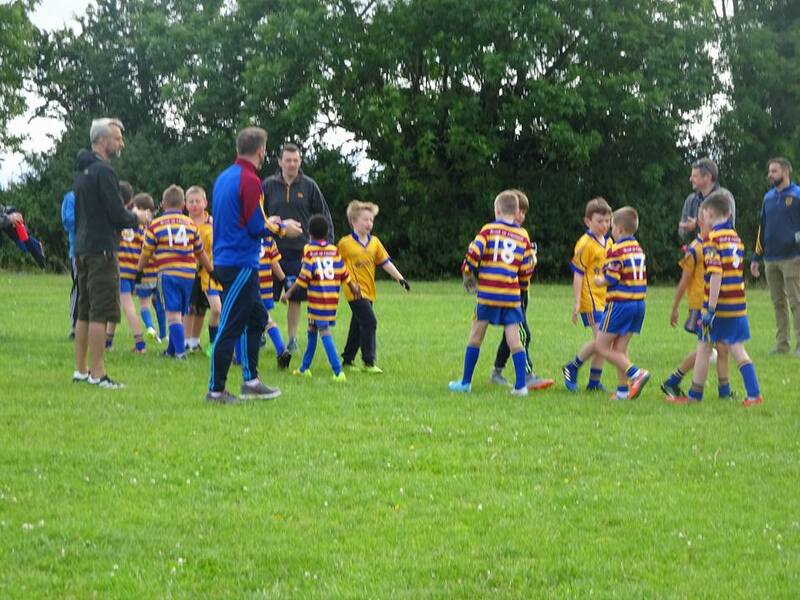 The u8s will make the most of the summer conditions though and keep training going right through until then. Hopefully we'll see everyone out for some fun at the family picnic next Saturday @ 4.30pm. The nursery teams were invited to an end of season Football and Hurling Blitz in Binn Eadair on Saturday morning. We had 3 teams made up of both U7 and U6 players who played 4 grueling matches against teams from Binn Eadair and Raheny. The Scoil teams showed great heart and determination and lots of great skills in both football and hurling. There were great blocks, tackles, some tough challenges and great scores. Both coaches and parents were very impressed how all the players kept going right until the end of all the matches whether winning or losing. Well done to Players of the Week Peggy & Cara, seen here with their proud dad and nursery coach Shane.